Problems with tough bacterial infections, like Ulcers? Can't find antibiotics? Uncomfortable giving injections? Can't catch your fish? 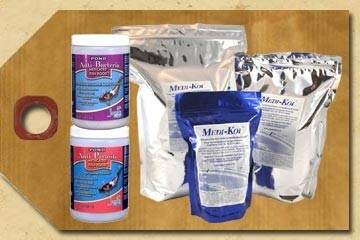 Medi-Koi is the next best treatment for tough fungal and bacterial infections in your pond fish. Sick fish love Medi-Koi! 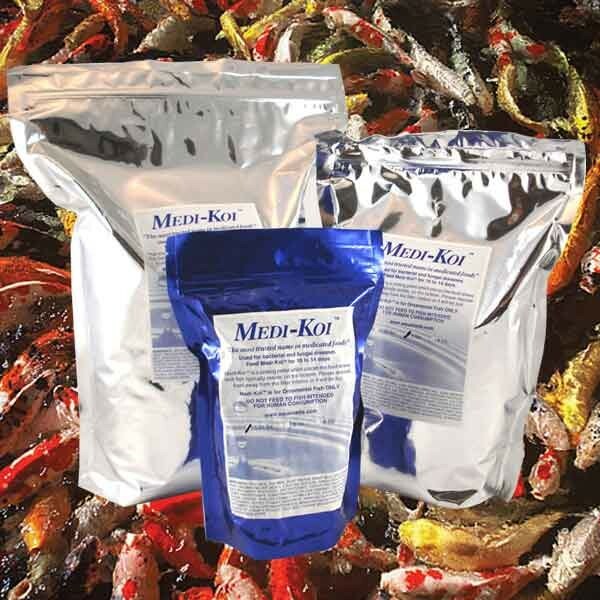 Medi-Koi is a custom made sinking pellet which places the medicated food on the bottom of your pond where your sick koi and pond fish tend to stay. Formulated with three powerful antibiotics and special tested ingredients that stimulate your sick fish's appetite so they receive the life saving medications they need to bring your fish back to good health. Now here's the best part! Sick fish eat very little, and research has shown sick fish must eat at least 3% of its body weight of most medicated food everyday to be effective. The good news is, using Medi-Koi all your sick fish have to eat is 1% of their body weight. That's just 1/3 of the medicated food your sick fish has to eat compared to other medicated fish foods. Attention: Do not feed Medi-Koi to fish intended for human consumption.